The New Fools … fed up with explaining band names so straight away … “girl by the whirlpool’s looking for a new fool”…. You’re in three bands and time is tight, so you quit one band hit a songwriting run and find out you’ve got 15-20 songs … do you bin them or fire up some friends to help you record them … quick, capture the moment like a photograph or diary page … then get them out of my head!!!! Dave Seabright: Bass player Dave and I went to school in Haverhill during the 70’s and early 80’s … that should give away our vintage! We were always destined to be in a band together, just never thought it would be 30 years later! Drew Keen: We originally decided I would attempt the guitar playing, then realised we needed a grown up! I remembered Drew as he used to accompany a choir that both our wives attended. He is one of the busiest musicians I know … but still finds time to colour in my b/w outlines with the added bonus of trumpet duties as well! 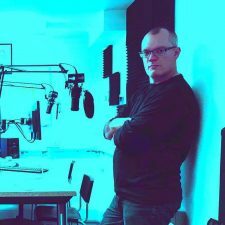 Tim Willett presents the New Music Generator on Cambridge 105 (on 105 FM, Online and DAB Digital Radio) across Cambridge every Wednesday night from 7-9pm.